A task is created in a task item. To create a new task, create a new task item. A new task can also be added to an existing task item. Open and edit a task item. On the Catalog pane, right-click a task item in the Tasks folder and click Edit In Designer. Click New Task on the Tasks pane to create a new task. A new, empty task is created and selected in the Tasks pane, and the Task Designer pane displays the properties of the new task. The Task Designer pane displays the properties of the selected item in the Tasks pane. To display the properties of the task item, select the task item heading. Make sure the new task is selected and type a task name and a description on the Task Designer pane. The task description should describe what the task will achieve. For example, Create a road centerline. If you do not want the task to display in the tasks list on the Tasks pane, choose Hide this task. You would want to hide a task when the task is incomplete, or when the task is never used. For example, a person working with parcels may never create or edit condominiums and would not want to see tasks that work with condominiums. Save the project to save the changes to your task item. Close the Task Designer pane to exit task design mode or click New Step to create a new task step in the selected task. A task can be created as a stand-alone task or in a task group. A task group organizes a set of related tasks together. 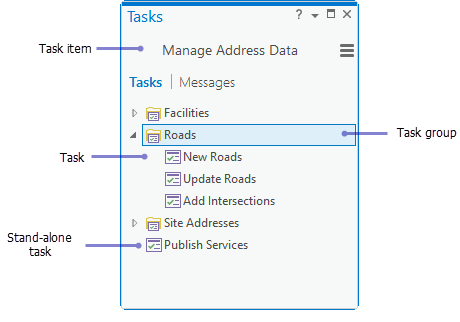 For example, a task item that contains tasks for managing address data may have a task group for managing public roads, and a task group for facilities. A task can be created as a stand-alone task or in a task group. On the Tasks pane, click Options and click Edit In Designer to open the Task Designer pane. Click New Group on the Tasks pane to create a new task group. A new, empty task group is created and selected in the Tasks pane, and the Task Designer pane displays the properties of the new task group. On the Task Designer pane, type a task group name and description. Close the Task Designer pane to exit task design mode or click New Task to create a task in the selected task group. When the Task Designer pane is open, you can drag and drop a task into a task group, and between task groups.